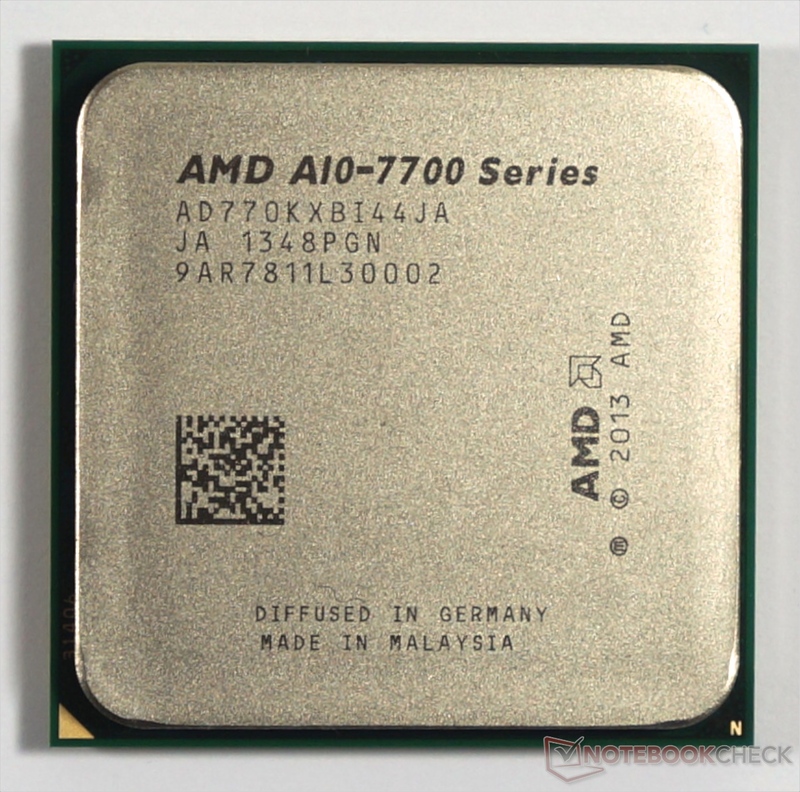 The AMD A10-7700K is the second fastest model of the desktop Kaveri line-up at the begin of 2014. It is a quad-core processor that integrates two Steamroller modules with four integer cores and two FPU cores. The integrated AMD Radeon R7 graphics card integrates 384 cores (6 computes cores) and can be used seamlessly with the CPU thanks to HSA. As Richland, Kaveri supports DDR3-2133 main memory. The fast GPU however needs fast RAM and profits from overclocked (2400) dual-rank memory configurations. Compared to the fastest A10-7850K, the 7700K is slower clocked (3.7 / 4 GHz versus 3.4 / 3.8 GHz) and the GPU offers less cores (8 versus 6 compute cores). 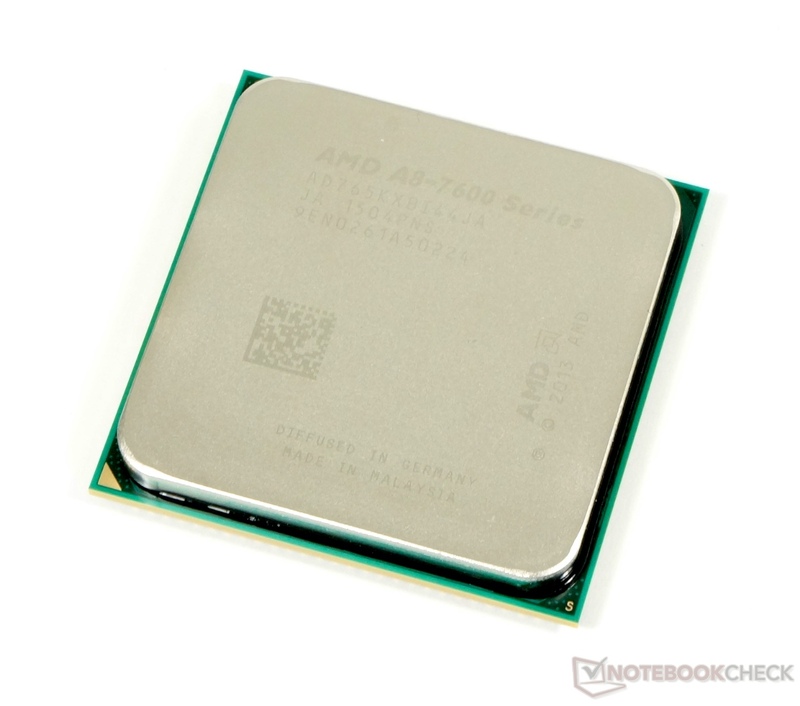 The AMD A8-7650K is a mid-range Kaveri APU for desktops. It is manufactured in 28 nm and integrates two Steamroller modules with four integer cores and two FPU cores. The integrated AMD Radeon R7 GPU consists of 384 cores split evenly amongst 6 computes cores and can be used seamlessly with the CPU thanks to HSA. Kaveri supports DDR3-2133 main memory similar to Richland, but the integrated GPU can also benefit from faster system RAM in dual-channel configurations. Compared to the similarly fast A10-7700K, the A8-7650K offers the same Boost clock rate (Pb0) but a slightly slower base clock speed (-100 MHz). 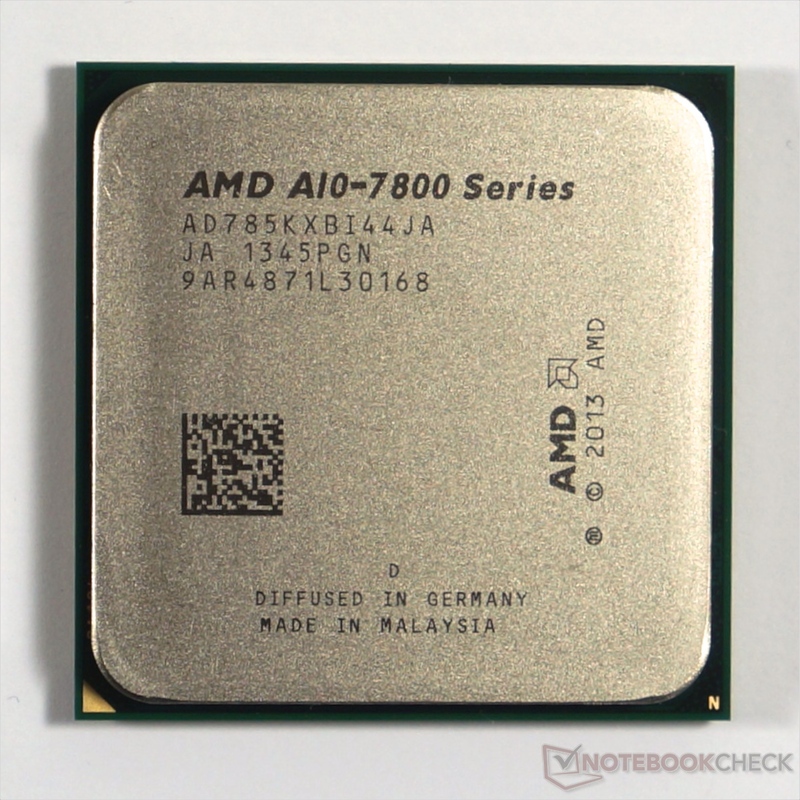 Compared to the fastest Kaveri Desktop APU, the A10-7850K, the A8-7650K is clocked slower (3.7 to 4 GHz vs. 3.3 to 3.8 GHz) and the GPU offers less compute cores (8 vs. 6). The A8-7650K is on par with the more expensive A10-7700K APU due to their similar clock rates. Notably, the AES benchmark in TrueCrypt runs 5% faster on the A10 in our tests. Single-core performance is generally weak on the Kaveri APU series. Although the A8-7650K can run up to 3.8 GHz, performance is only on par with the dual-core Intel Core i3-4030U (Haswell 1.9 GHz) and Intel Core i3-5005U (Broadwell 2 GHz). Multi-core performance fares much better on average as the A8 is able to compete with an Intel Core i5-4200M (Haswell 2.5 - 3.1 GHz) and Intel Core i7-5600U (Broadwell 2.6 - 3.2 GHz). However, both of these Intel CPUs are dual-core processors while the A8-7650K is quad-core. The performance of the integrated Radeon R7 is analyzed in detail on our dedicated page. In short, the GPU is a strong bullet point for the A8-7650K. It easily outperforms the integrated Intel GPUs of the above mentioned CPUs and is on par with a dedicated GeForce 840M. Combining the strong integrated GPU with CPU and OpenCL acceleration leads to good results in PCMark 8 benchmarks. The PCMark 8 Home test in particular shows very good results similar to the Schenker M504 laptop that features a Core i5-4310M and a dedicated GeForce GTX 850M. The Broadwell-based XPS 13 achieves only 85 % of the performance of our A8 test system. The PCMark 8 Creative test is not as impressive as the M504 pulls ahead by 30 % compared to the A8-7650K. The older PCMark 7 without OpenCL acceleration is noticeably slower as the AMD APU is comparable to notebooks with a Core i5-4200U. This is also the case in the Browsermark browser test. See the provided charts below for more detailed results. The TDP of the desktop A8-7650K APU is specified at 95 Watt and is therefore 5 Watt below the top Richland models. $173 U.S. $152 U.S. $152 U.S.